Atop the cliff, stands the Cape d'Or Lighthouse looking out over the beautiful scenery of the Minas Channel in the Bay of Fundy in Nova Scotia, Canada. On the peak of a rock jetty overlooking the Minas Channel in the Bay of Fundy in Nova Scotia, Canada, stands the Cape d'Or Lighthouse. 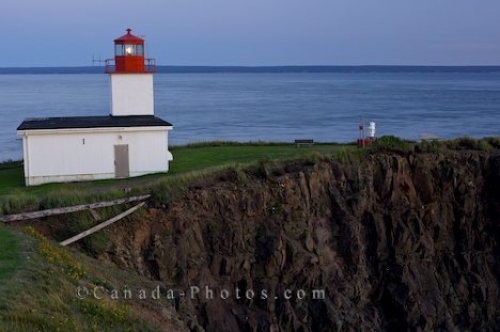 Since 1922, there has been a lighthouse on this cliff watching over the vessels traveling the waters where the Bay of Fundy meets the Minas Basin. The lighthouse which stands at Cape d'Or today was built in 1965 and it is the only lighthouse throughout Nova Scotia where visitors can enjoy overnight accommodations. Spend the day hiking the trails to towering cliffs or explore the rocky beach where the scenery is beautiful and then watch the sunset hues take over the sky while having dinner in the Lightkeeper's Kitchen Restaurant. Cape d'Or Lighthouse at blue hour, Cape d'Or, Cape Chignecto, Bay of Fundy, Fundy Shore Ecotour, Glooscap Trail, Highway 209, Minas Channel, Nova Scotia, Canada. Picture of the scenery from the cliffs near the Cape d'Or Lighthouse overlooking the Minas Channel in Nova Scotia, Canada.